Lucia, a Peruvian journalist based in Madrid, has found recognition and love next to Rodrigo, Editor of the Spanish JETSET MAGAZINE. Considering a big money proposal regarding the demolition of her sister’s colonial mansion, Lucia decides to return briefly to Lima after decades. Lucia's sister does not want to sell the property, claiming to be in contact with a ghost who has inhabited the house since 1821. Lucia then meets Gonzalo, who encourages her to preserve the mansion. Lucia struggles under Rodrigo’s pressure to return to Spain whilst she witnesses the presence of the ghost herself. The plot thickens as a parallel story unfolds in the very same house over a century before, during a time of Spanish oppression. By the end, the two eras intertwine in Lucia’s ultimate decision. Rocío Lladó is a director and producer. 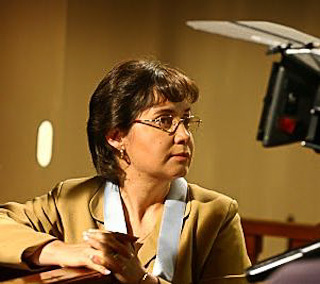 Before her latest project, TERESA LA NOVIA DEL LIBERTADOR, she directed her first feature, VIDAS PARALELAS in 2008. In 2012, she was recognized by the Peruvian Congress' Commission on Culture. Want to see more than one film?